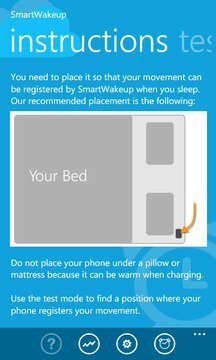 Use SmartWakeup to get woken up in the lightest sleep phase. SmartWakeup uses the accelerometer to collect your movements through the night and correlates these values with you sleep phases. 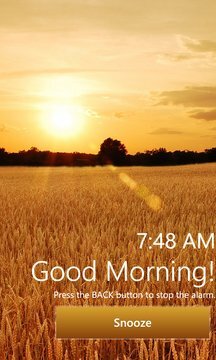 In order to push your morning you can choose your wake up sound from your own MP3 collection saved on your Windows Phone. When downloading the app SmartWakeup comes with 5 wake up sounds.